Superberries' Aroniaberry Gummy Chews are a good-for-you antioxidant snack. But they also lend a fruity flavor when used in baking recipes. Plus their berry shape makes them a fun decoration for cookies and cakes. 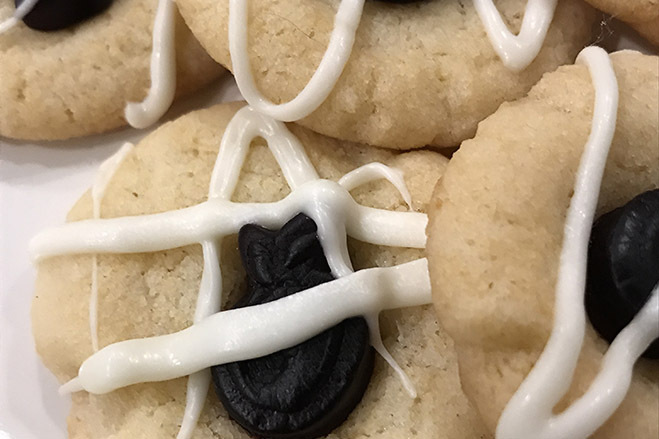 Make these cookies featuring our Superberries' Aronia Berry Gummy Chews for your next gathering. You'll love the berry yummy fruity flavor of our Gummies nestled in a sugar cookie. Easy to make and perfect for family gatherings. Drizzle with white chocolate to make these cookies even more festive and flavorful. Makes about 36 cookies. It's just another fun way to add Aroniaberries to your day. Preheat over to 375 degrees. In a large bowl, add cookie mix, butter and eggs. Mix until dough forms. Shape into a ball. Take a teaspoon of dough and roll dough into 36 (1-inch) balls; place on a cookie sheets. Make a small indent in each cookie. Bake cookies 8 to 10 minutes until golden. Lightly press an Aronia Berry Gummy Chew in the center of each cookie. Let cookies cool on cookie sheets, then transfer to a cooling rack to cool completely. In a small bowl, heat white chocolate chips in microwave for a minute. Add 15 seconds to the microwave cook time and start. Stir. Remove from microwave and stir again. Do this until chips are fully melted and smooth. Transfer to a resealable plastic bag and cut a very small hole in the corner of the bag. Drizzle white chocolate over fully cooled cookies. Allow icing to set completely before serving.